‘Do you remember when we won superteams? ?’ was the chant that echoed in one’s ear if in the company of one of the members of our team: ‘Our drinking team has a football problem.’ On Monday afternoon, most of us had a hangover or were still drunk from the previous night of celebration for winning what seems to be the most prestigious event at Aberystwyth University; for the woman’s football club anyway. Back in September on the very first social, Nat, the club’s president told me that Superteams is the best weekend of the year and that this year we were going to win it. I didn’t quite understand what Superteams was back then but now I know that everything she said was true. Superteams has been the absolute best weekend at university so far. It was incredibly nerve wrecking; so nerve wrecking that it nearly wasn’t fun anymore but it was worth it in the end. So first of all, let me explain what Superteams is exactly. It’s an event hosted by the students union of Aberystwyth University and any student of the university can take part. Students are required to make a team of 10 and compete in a variety of sports during the weekend. This year the sports included were swimming & kayaking, tug of war, bleep test, basketball, dodgeball, football, gym test, 100m sprints/relay, campus mile and the mystery event. For the women’s teams, 26 teams participated and our football club had a first and a second team. Now for all of you to understand the significance of this event you need to know that last year the football team lost to netball by one point. The year before that, football came in second behind netball as well, meaning that losing again this year was not an option! Therefore, our team had been running campus mile every week from near the beginning of the academic year. The mile, our sprints and swimming times were timed. We tried out the bleep test, the sprints, dodgeball and some of the team joined basketball training weeks prior to the event. We were going to win Superteams. The event started on Friday the 26th of February and started off with swimming, closely followed by kayaking. We did pretty decent and could sit out the event after since our team dropped tug of war because… you see… in my team I am considered kinda tall. Our team is too little and we would need more weight to do well in the event. However, our second football team did participate in the tug of war and stumbled upon the same problem that our first team would have had. The last event of the day was the bleep test which was the first event I took part in. This is because, for all the events that day, only 4 out of 10 people were required to participate. For the bleep test, the scores that counted were the ones of the last two people that were still in. From our team, I dropped out first, just a little while before Vanessa while Annie and Holly managed to go on. Annie was about to drop out when Alex pushed her back in which is the reason why we won and beat netball by just 0.1 point! The second day was filled with team sports: basketball, dodgeball, and football. All events today were knock-out events and our team had to play basketball in the first round of the basketball event. The basketball team scored twice quickly, but our team managed to recover and score three times after. We knocked out basketball in the very first round! We didn’t win the entire event, however, and were beaten by netball in the semi-finals. After basketball came dodgeball. It’s an event we were all very excited about but didn’t get to play much of. The day ended with football, the event that we put our joker on (double our points). It’s the one event we definitely had to win since… you know, we are the football club and even though the fear of losing seemed to have crossed some of our minds, we had nothing to worry about. Our first team won the event and we got our double points! Everyone was quite nervous on the last day. Netball firsts had won basketball, dodgeball and performed better than we did in the swimming event. The netball team put their joker on the gym test, the first event of that day. The gym test is very much a team event. There are nine stations and each member except for one has to complete one station. The entire event is timed and the person at every next station is only allowed to start once the person at the previous station has completed theirs. The stations included burpees, suicide runs, skips and squats with a 10-kilo ball. Although we did well, we came in second behind netball. The gym test was followed by sprints which were one of my favourite events! Initially, six people were supposed to run the 100m relay but it got changed back to just 4. We knew we were able to do well as our team is fast and consists of runners. The four of us managed to get a time of 0.58 seconds and came in first! Like the previous two events, the campus mile worked as a relay and 5 of us had to run it. Holly, our captain, started and came in first. All of us beat our previous records by 10 to 30 seconds and even though our lungs burned afterwards (and Alex even had to throw up), we beat the harriers and won the event that we had trained for so long! Having won the last two events, to me it felt as if we had already won superteams, but the most important event was yet to come. The mystery event is the event that can make a difference. It’s all about teamwork and is worth more points than the other events. To our delight, the first obstacle was a bouncy castle! Once out of the bouncy castle, we had to run to the table with… well… disgusting food that included a raw onion, lemonade and beans and an onion in jelly amongst others. As if the previous running events had not been enough, we then had to run all the way to the other side of the football fields where two little pools with something that smelled awful were waiting for us. Two of us had to go in at the same time and try and find matching numbers on little ducks. After this, we had to crawl through two tunnels, throw hoops on sticks, carry a weight with the team without being able to run while holding the weight, move forward as a team by piggybacks, shoot cans with a water gun and jump into another bath whilst cleaning powder was thrown at us. We did not get to know who came in first in the mystery event until later that night. All teams gathered in a clubhouse in town where our team was getting drunk because we were already convinced we had lost. The wait for the results was, even more, nerve wrecking than when the actual events took place. And then it turned out we won! And we got to celebrate all over again in the weekend after with the guys. No cameras allowed in the aftermath. There’s nothing else I have to say. 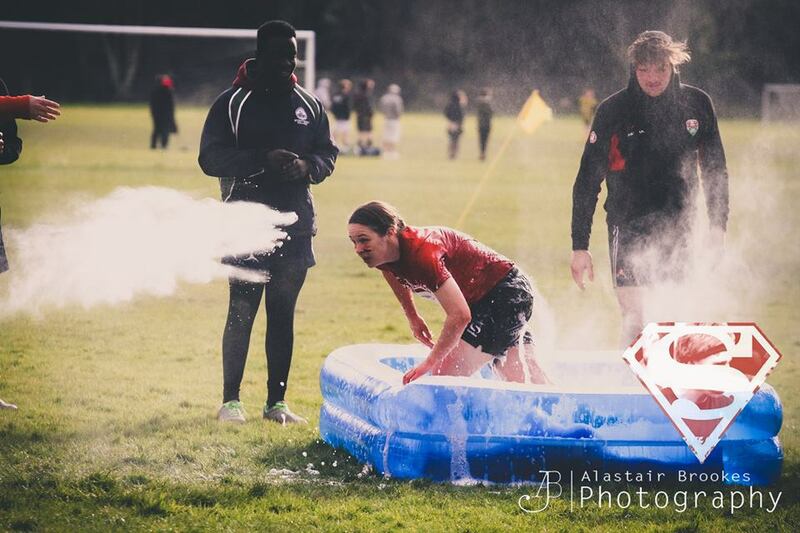 Superteams is hosted by the Aberystwyth University Student’s Union and more information can be found here.